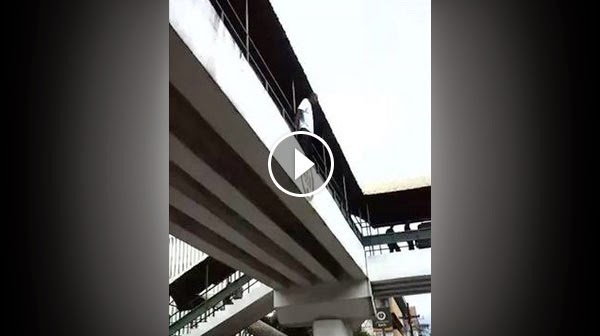 A video showing a man who jumped off an overpass at the intersection of Valeria and Delgado streets in Iloilo City is making rounds on Facebook. According to a certain Dr. Lanie Love Mañosa, the incident took place at Marymart shopping center near SM Delgado on Tuesday, December 30 at around 4PM. In the video of what she described as a "suicide scenario," the identified man is seen holding the flyover railing when he suddenly jumped as a firetruck attempts to block the concrete pavement where he was expected to land, but to no avail. Onlookers and some policemen were on the scene when it happened. The rescue team arrived a few moments later. It was not known whether or not the man survived the fall. The cause of his apparent suicide attempt is unknown either but some netizens commented that the man, who's said to be 46 years old and from out of town, has been rumored to be suffering from depression because his wife cheated on him. This was not independently verified. Some commenters posted that the man broke his legs and was brought to a government hospital in Iloilo after jumping off the mall's overpass.